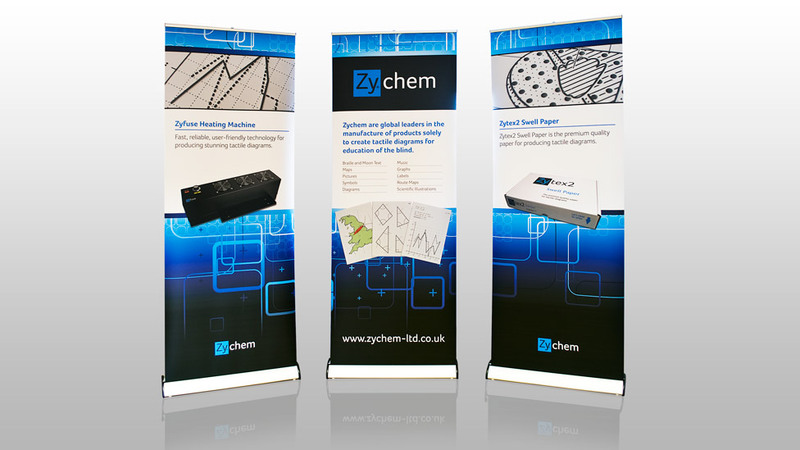 We designed a versatile corporate pull up banner that allowed Zychem to maximise their investment. In order to support the new brand and logo design created for Zychem, the company required a suite of A1 laminated posters and corporate pull up banner designs for their exhibition display. With plans to use the exhibition materials at trade shows, both in the UK and globally, it was decided that the most effective way to meet the client’s needs was to create a series that could be used either as a set or individually. Offering the maximum flexibility for Zychem’s business development teams, these systems can easily be transported by car or plane, and be assembled by one person where necessary. For the exhibition design, we maintained the minimal feel of the brand and complemented it with high quality product photography and vivid colour treatments. The requirements of the partially-sighted target audience were such that each poster and corporate pull up banner needed to be extremely legible and clear, focusing on key product messages.